DAVID LE/Staff photo. 4/1/15. 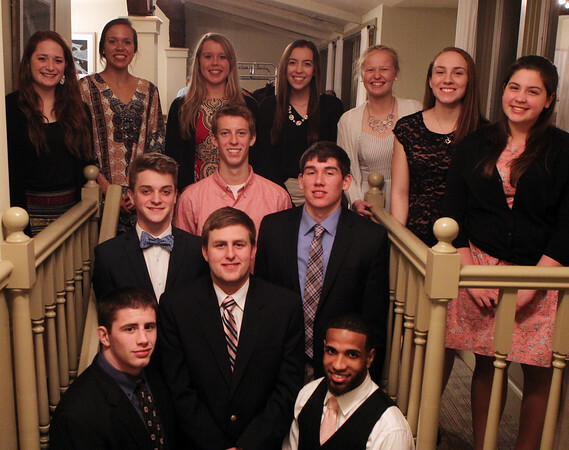 2015 Salem News Student Athlete Award winner Spencer Craig, of Marblehead High School, surrounded by other nominees including Ian Butterbrodt (St. John's Prep), Yordany Sanchez (Essex Tech), Kyle Doherty (Salem), Myles Connor (Bishop Fenwick), Cameron Holley (Manchester-Essex), Sarah Godschall (Peabody), Meghan Collins (Masconomet), Ellie Swenson (Ipswich), Raquel Leslie (Danvers), Emily Weigand (Hamilton-Wenham), Samantha Rizzo (Swampscott), Kelsey Dion (Pingree), and not pictured Astrid Swensen (Beverly).